Here they are - the Topps All-Star Rookie Team, selected "by the Youth of America" following the 1988 season and featured in the 1989 Topps set. Cleveland (A.L.) 1987; Chicago (A.L.) 1988 - '90; Baltimore (A.L.) 1990, California (A.L.) 1991, 1995; New York (N.L.) 1992 - '93; Atlanta (N.L.) 1994; Philadelphia (N.L.) 1995. Journeyman. That's Dave Gallagher to a T. He'd already been through two organizations before getting his first shot at a full MLB season in 1988. He came up to the White Sox in May after burning up the minors with the Vancouver Canadians, hitting .336 with 4 homers in 34 games. He became the White Sox starting Center Fielder and stayed in that role for the rest of 1988. He hit .303 for the season with 15 doubles and 5 homers. 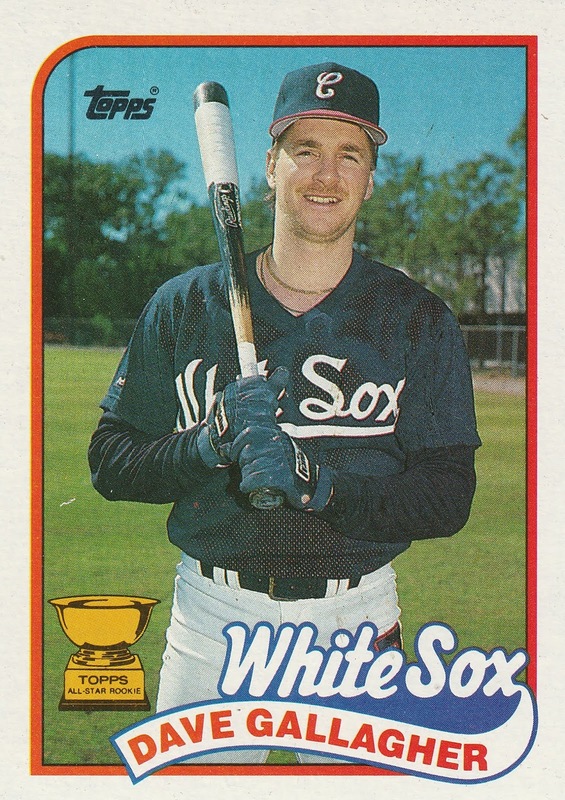 Gallagher came back in 1989, playing in 161 games for the ChiSox, a career high. He was again penciled in as the everyday CF, though he did play both corner spots as well as needed. He rapped out 160 hits including 22 doubles in 1989, and played sterling defense, leading all AL center fielders with a .994 Fielding pct. In 1990 he started the year with an injury but would find himself passed in the depth chart by the blazing quick Lance Johnson. He would ultimately play for 8 different teams in his 9 year MLB career. 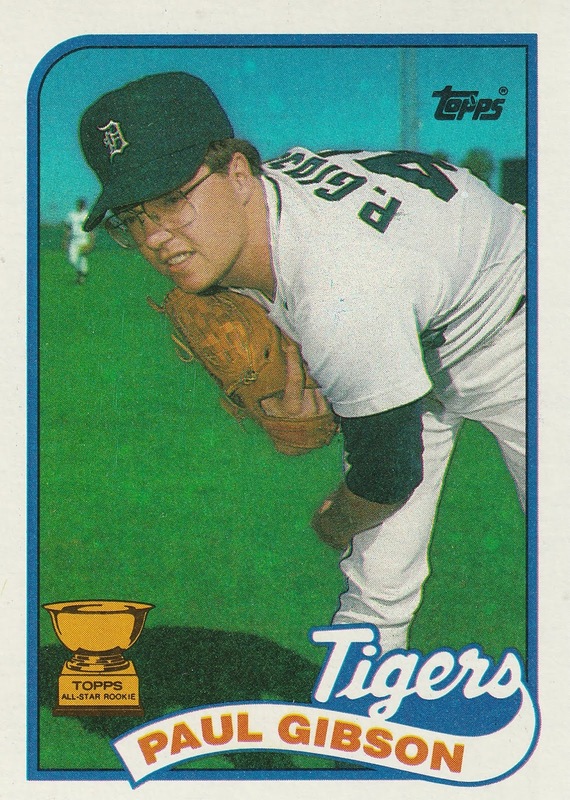 Dave's Rookie Card is in the 1988 Donruss "The Rookies" set, and he also had cards in Fleer and Score's 1988 Update sets. Los Angeles (N.L.) 1983; Texas (A.L.) 1987 - '90; Pittsburgh (N.L.) 1991 - '92; Cincinnati (N.L.) 1993. Stuntman. Cecil Espy would start his career as a base stealing barn burner, and in later years would find a second life as a situational pinch hitting threat. Espy was drafted in 1980, and made his MLB debut at the age of 20 as a late season call-up with the Dodgers in 1983. It would take him 5 seasons in the minors before getting his first full season of MLB action in 1988 for the Texas Rangers. In 1982 at Single A Vero Beach, Espy stole 74 bases in 131 games. He was regularly stealing 40, 50 bags a year in the minors each year while climbing the minor league ladders in Los Angeles and Texas orgs. 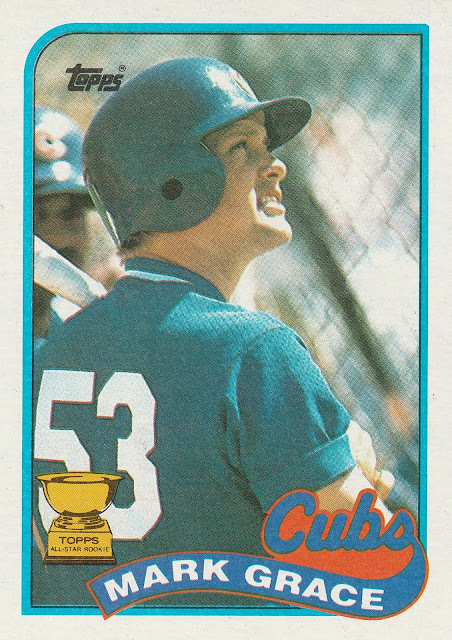 He had been hitting in the .270s or so in the minors until 1987, when he hit .302 at AAA OK City to go along with 46 steals, making the case for his call up. 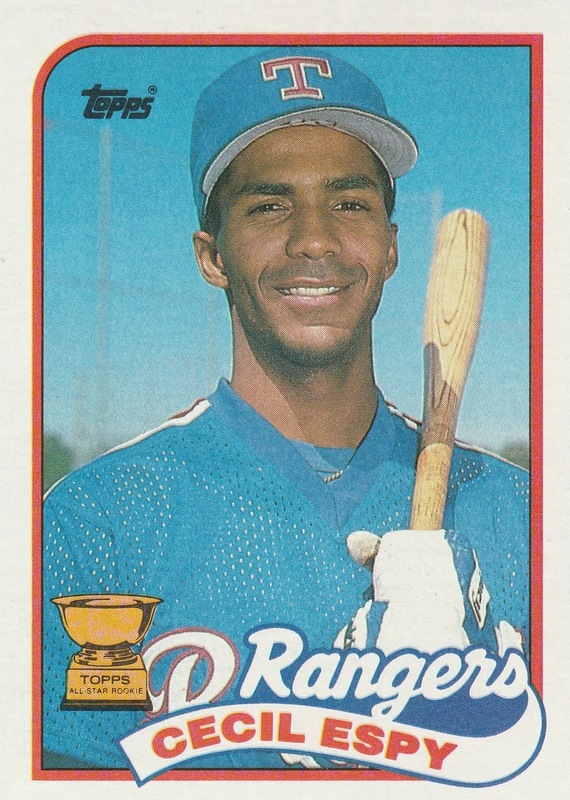 In his first full season in 88 he stole 33 bases for the Rangers, then 45 steals in his Sophomore season. He would still struggle to hit MLB ptiching consistently, and ended up at AAA Buffalo for the Pirates in 1991. He hit .312 in AAA, and wound up right back in the big leagues, this time as a 4th outfielder and pinch hitter. Espy's last play as a Pirate was infamous - he misplayed a Terry Pendleton liner in right field that would prove to be the beginning of a rally that culminated in the Pirates being bounced from the 1991 NLCS. He would also play a season in the Mexican League in 1996 for Oaxaca. Bone. 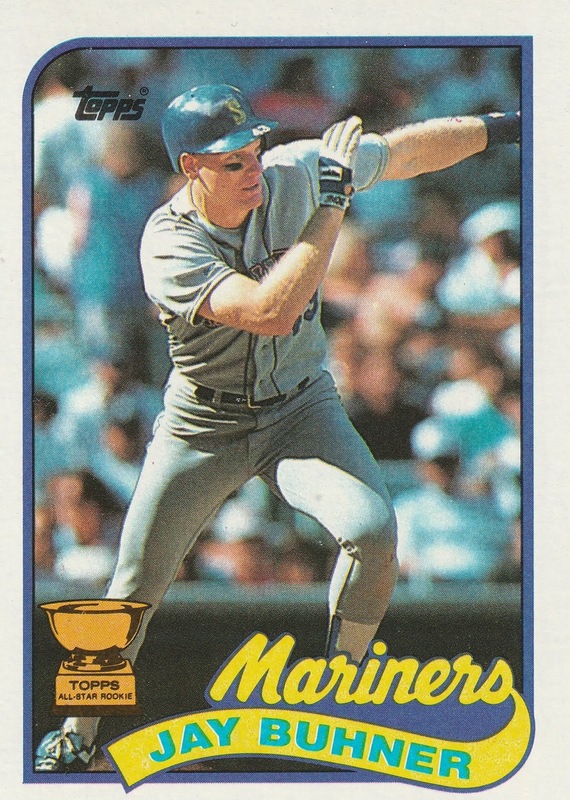 Jay Buhner was shipped off to the Mariners in exchange for power hitting DH/1B Ken Phelps, and the angst is revisited to this day on re-runs of Seinfeld. 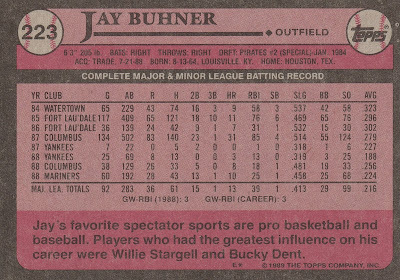 Even when that episode aired, it was early in Buhner's career, he had a long way to go to show the short sightedness of the swap. 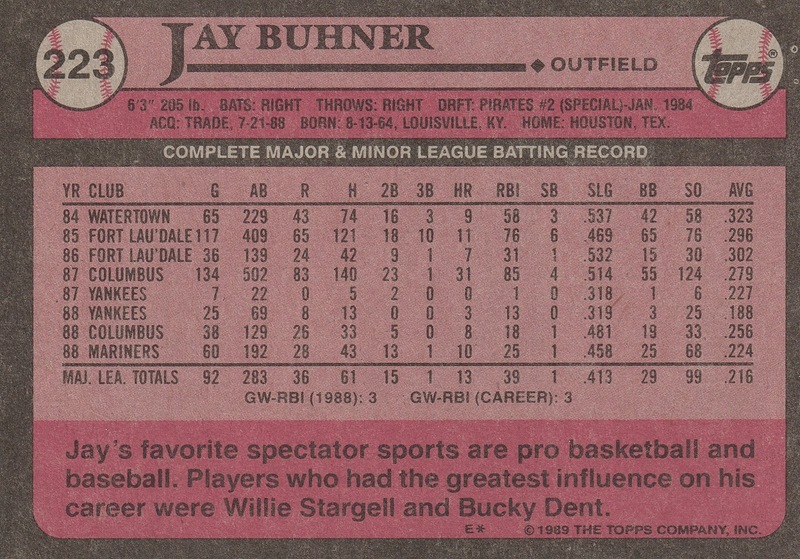 Buhner would hit 40 or more homers in 3 straight seasons at his peak, including an All-Star nod and a Gold Glove award. He would hit over .300 in the playoffs in his career, including 8 big flies. His rookie season with Seattle was not especially impressive, but he would go on to a long career as the a fan favorite in Seattle. He was a fixture in Right Field, where the Mariners would host Buhner Buzz Cut nights, encouraging fans to shave their heads for tickets. He finished with 310 homers and 958 RBI over 15 MLB seasons. He's a member of the Seattle Mariners' Hall of Fame. Atlanta (N.L.) 1987 - '93; Cincinnati (N.L.) 1995; St.Louis (N.L.) 1996 - '98; Philadelphia (N.L.) 1999 - '00; Anaheim (A.L.) 2000; Colorado (N.L.) 2001; Oakland (A.L.) 2001, 2003; San Diego (N.L.) 2002. HE WAS SAFE! Just kidding, he was totally out. In the 1991 World Series, both the Twins and the Braves had gone from Worst to First. Last place finishers in 1990, league champions in 1991. 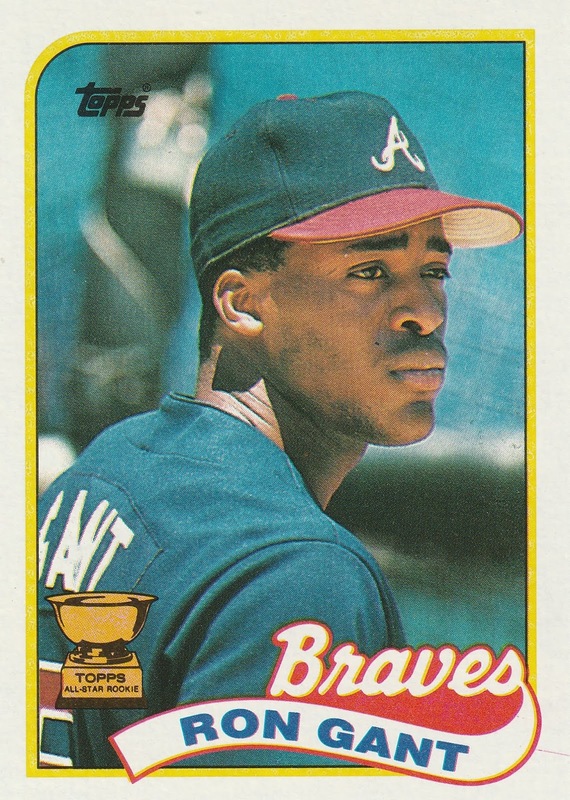 For the Braves, getting there was thanks in no small part to Ron Gant. Gant went from being the team's future 2B, to leading the league in errors and being sent back down the the minors to learn a new position in the outfield. He responded well to the demotion by coming back to the big leagues with a vengeance in 1990. He was a 30/30 club member in 1990 and 1991 - hitting over 30 homers and stealing over 30 bases. In his Rookie All-Star season, he hit 19 homers and stole 19 bases as a second baseman. 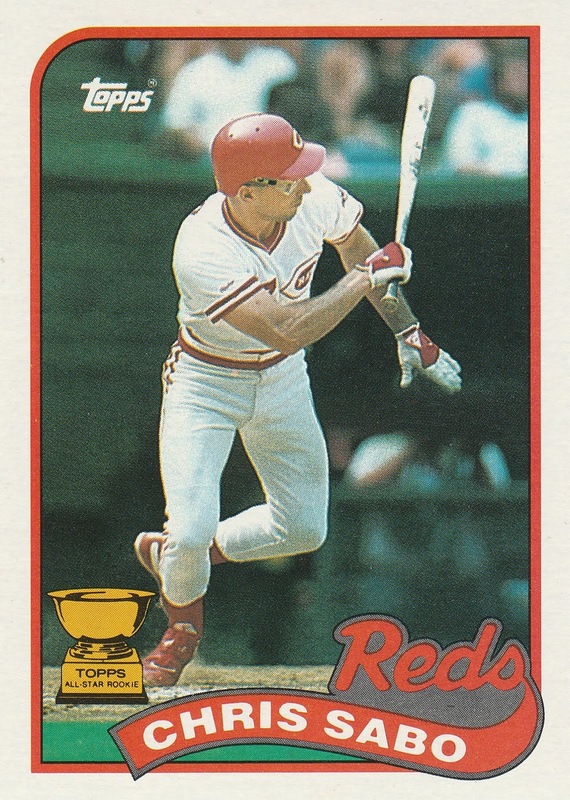 He would miss the entire 1994 season due to a broken leg while driving an ATV, but again he would overcome the adversity and return to the big leagues with a fantastic All-Star season for the Cincinnati Reds. He would move around both leagues after his comeback, finishing his career with 321 homers, 243 steals, and 1,008 RBI. He would play in a pair of World Series with the Braves, and would be bounced from the playoffs by the Braves in two other seasons. Oakland (A.L.) 1987 - '92; Florida (N.L.) 1993; Colorado (N.L.) 1994 - '97; Atlanta (N.L.) 1998 - '00. Weiss was an unlikely Rookie of the Year - he didn't hit for average, he didn't hit for average, he didn't hit lefties, he didn't hit righties.... you get the point. But defensively at Short, Weiss had few peers. 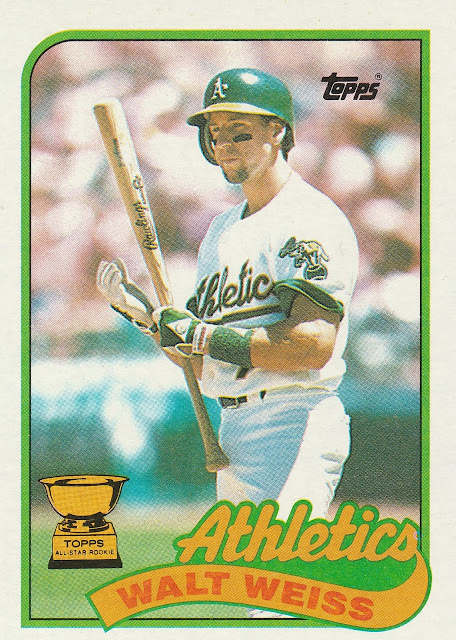 It didn't hurt that he was part of a Rookie of the Year dynasty in Oakland, following in the footsteps of the Bash Brothers. His defense was so good that the A's traded away Alfredo Griffin to allow him to play everyday as a rookie. His defensive metrics were respectable throughout his career, he was 5th in the AL in Fielding pct and 3rd in Range Factor in 1988. Despite the reputation as a great fielder, Weiss never won a Gold Glove, ironically this was probably more about his poor hitting than his defense. Fairly or not, many Gold Glove winners could also hit a bit, especially in the late 80s / early 90s. After a mini dynasty in Oakland including a 1989 World Series victory, Weiss was traded to the expansion Florida Marlins before their inaugural season. He would also play several seasons with the expansion Colorado Rockies early in their history and later became the Rockies' manager. Weiss made his only All-Star appearance in 1998 with the Braves. Los Angeles (N.L.) 1987 - '91; Cincinnati (N.L.) 1992 - '93; Chicago (A.L.) 1993; Detroit (A.L.) 1994; Seattle (A.L.) 1995; Kansas City (A.L.) 1996 - '98; Anaheim (A.L.) 1999 -'00. 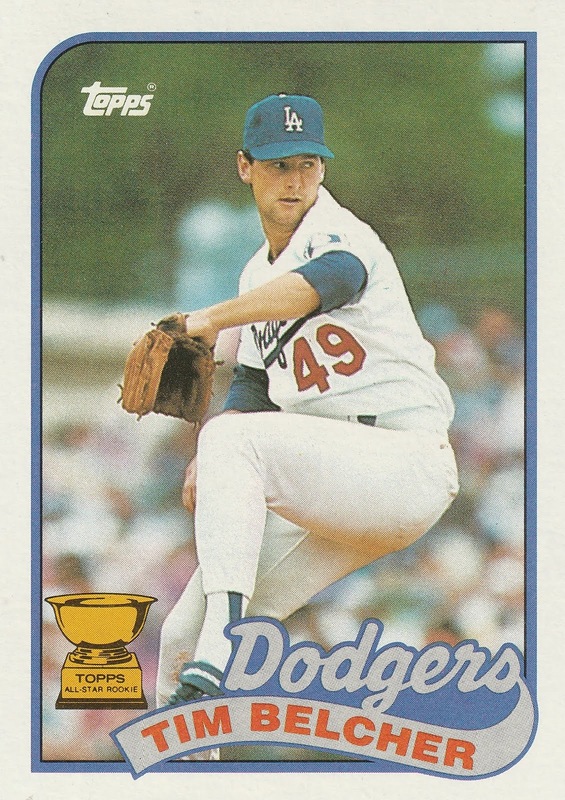 As a Rookie, Belcher was a pleasant addition to the Dodgers' rotation, helping the team make the playoffs and ultimately win the World Series. He won 2 NLCS games and one game in the World Series. In his second season, he would lead the National League in Shutouts (8) and finished 6th in the Cy Young Voting. Belcher was part of a trade that brought Eric Davis to the Dodgers and from that point on he became a nomadic pitcher, never spending more than a season or two in any spot. For his career, Belcher was almost exactly league average, finishing above .500 with a 146 -140 career record. He won 15 or more games 3 times. The 3 time All-Star and 4 time Gold Glove winner was synonymous with Cubs baseball in the 90s. He hit .308 and had over 2,200 hits and 1,000 RBIs as the Cubs' First Baseman, and was the NL leader in doubles in 1995 with 51. Cubs fans were sad to see him go to Arizona, but I would be shocked if they weren't also extremely happy for him in 2001 when he won his only World Series championship, even though it wasn't on the Northside. Grace had 144 hits as a rookie, just shy of .300, and walked more than he struck out. He would have a great eye at the plate throughout his career, finishing with a .383 on base percentage. Not bad for a 24th round draft pick! Cincinnati (N.L.) 1988 - '93, 1996; Baltimore (A.L.) 1994; Chicago (A.L.) 1994; St. Louis (N.L.) 1995. Sabo beat out Mark Grace for the 1988 NL Rookie of the Year, mixing power speed and defense. Sabo stole 46 bases as a rookie, hit .271 with 11 homers and 40 doubles. He wasn't expected to even make the roster out of Spring Training that year, but Reds' Manager Pete Rose saw a little of himself in Sabo's hustling play. He was not used as the starter for a good portion of the 1989 season, but like Ron Gant, he would return he next year with big numbers. The Reds cruised to a pennant in the National League thanks to Sabo's home run power, hitting 25 homers to go with 25 steals and 38 doubles. He would follow that up with an even better 1991, making his 3rd All-Star team in 4 years. The injury bug bit him again in 1992, and Sabo would find himself looking for part time roles with teams for the next few years. He was a bit of a late bloomer, coming up as a 26 year old rookie, but his first four years were right up there with guys like Josh Donaldson and Corey Koskie (both guys who would lose time to injury). Backup Catchers need love too! 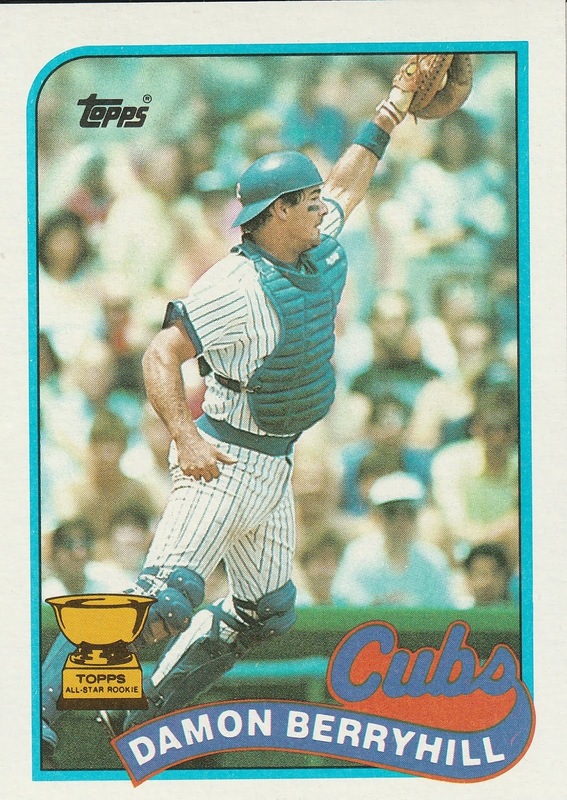 Damon Berryhill was not a backup at first, the primary catcher for the Cubs in 1988 and in their playoff run of 1989. He hit .259 as a rookie, which is good enough to make the Topps All-Star Rookie squad! In game 1 of the 1992 World Series, Berryhill smashed a game winning 3 run homer for the Braves, leading them to victory over the Blue Jays. After a pair of seasons with Atlanta, he would bounce around the league and like many journeymen catchers, he would find himself as a manager following his playing career. Most recently, he was the AAA manager for the Gwinett Stripers in 2018, and was the 2015 PCL manager of the year. Gibson's big glasses may not seem intimidating, but he didn't mind people underestimating him. As a rookie in 1988, Gibson was used out of the bullpen and struck out 50 batters in 90 innings and held opponents to a .240 average. He racked up 1.3 WAR out of the bullpen that season, and would be used often in the next few seasons as a lefty specialist. He wasn't a big strikeout pitcher, but he rarely allowed homers and kept his walk rate low throughout his career. Following his pitching days, he became a scout, and also opened a pitching academy, graduating major leaguers like Pete Munro and John Lannan. Oh man. I remember investing in Ron Gant and Chris Sabo. After 30 years... gotta admit... that Sabo is a sweet looking card.